BLF if a very useful feature that is beneficial to receptionists, secretaries, office managers, or anyone that handle a large volume of calls that gets routed to many different extensions. BLF in a nutshell is an indicator that lets you know the status of a specific extension by monitoring the hints. The indicator usually lights up in different colors or blinks to indicate the current status. A good example is the Yealink SIP T-38G IP Phone I reviewed which has multi color LED. Green LED means the extension is Available, Blinking Red means the extension is Ringing, and Solid Red means the extension is currently in use. This allows a person to easily identity and ask the caller if they would like to HOLD or be transferred to the Voicemail system. At this time, due to Asterisk’s inability to push the hints, DND function will not be indicated in the status hints. I have outlined the BLF setting for Polycom IP Phones in my previous article which involved the MAC-address-phone.cfg file. However, with non-Polycom IP Phones, the process is slightly different as they do not use these files and these features are enabled by the web-GUI built into the IP Phones. Once you have these changes in place, reload Asterisk and type: “core show hints” in the Asterisk CLI. This command will show the current extensions that are giving hints and which extension is monitoring for hints. When you see the hints and subscriber, the Asterisk configuration is done. 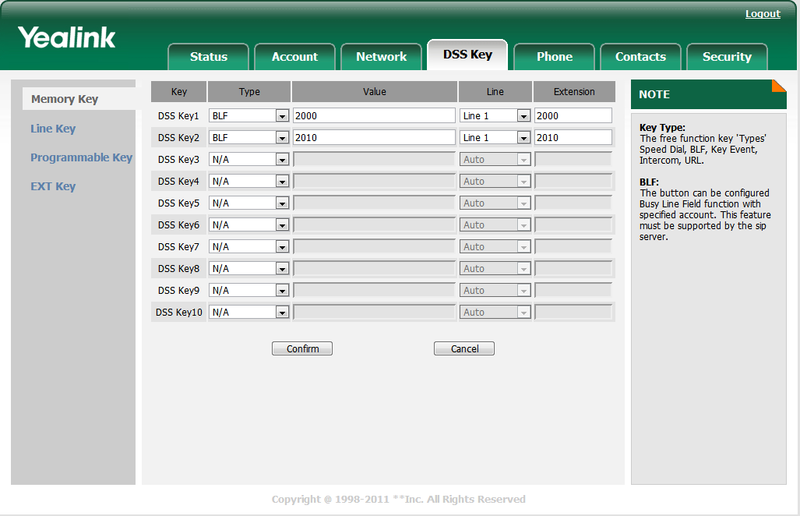 At this point, we have to assign the BLF fields to buttons or keys for the IP Phone via its Web GUI. This method varies by the phone make and model but it involves setting the key to BLF and specifying the extension you want to monitor. 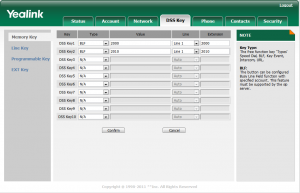 For your Reference, Yealink’s SIP T38G web GUI is shown below. NOTE: I am waiting for the RPS (Redirecting and Provisioning Service) from Yealink to come out of BETA status for the T3X series phones. Once I have access to this service, I am hoping that it will allow configuration parameters to be set for BLF.